HEALTHVIT FITNESS L – ISOLEUCINE L-Isoleucine is an essential amino acid and is routinely used by bodybuilders and athletes to improve performance and lengthen exercise regimens through increasing energy and endurance. L-isoleucine is one of the five most abundant amino acids that can be found in the skeletal muscles and makes up a total of about one eighth of all proteins in the body. Isoleucine is thought to play the biggest role in increasing endurance and helping heal, repair and grow muscle tissue damaged from injury and strenuous exercise and training. Isoleucine is especially important to serious athletes and body builders because of its role in boosting. • Enquired For Muscle Tissue Maintenance. • It Helps Build Strong Bones & Muscle. • Helps With Increase In Energy. Suggested Use :- As a dietary supplement, take 2 level scoops (2000 mg) mixed into your favorite beverage 2 to 3 times daily, or as directed by your physician. Mix for 20 seconds using a shaker cup or mix thoroughly with a spoon. 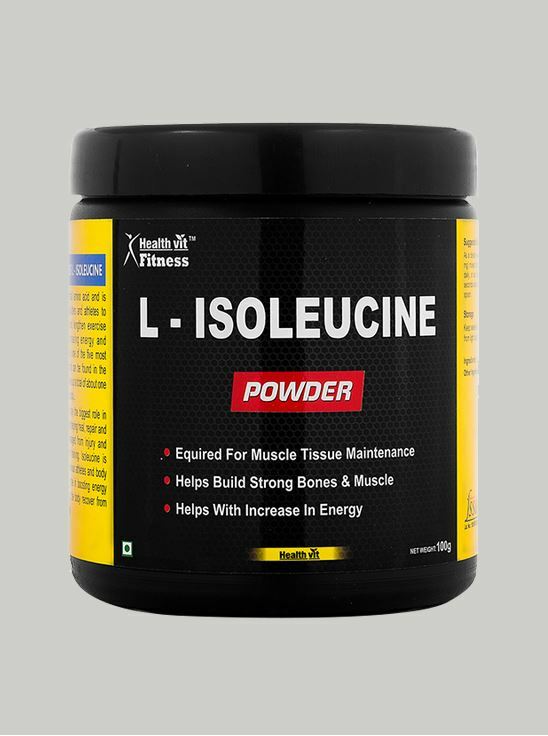 Ingredients:- L- ISOLEUCINE, Other Ingredients :- None NUTRITIONAL INFORMATION Servings Size: 2 scoop (2gm) serving per container: 50 Amount per serving. Storage :- Keep sealed in a cool dry dark place - protect from light and moisture. CAUTION • Not recommended for children. • Do not exceed recommended serving size. • Diabetic patients, pregnant or lactating women and patients suffering from other diseases need to consult with a healthcare expert or dietician before consuming this product. • This is a dietary food supplement and is not intended for medical use. • Store in a cool and dry place. • Contains artificial sweetener (Sucralose).